Where do you plan to host your big fat Indian wedding? If you are interested in destination wedding, then Bahrain should definitely be one of your location options. Recently, Bahrain emerged on the map of destination wedding locations when the wedding celebration of an Indian billionaire couple was hosted there with many high profile guests including Bollywood celebrities attending the celebration. And now, it’s an option for you too. For those planning the ‘perfect’ wedding, Bahrain has lots to offer with luxury resorts, romantic islands, picturesque beaches, and grand buildings. Let’s have a look at the wedding venue options you may have in this nation. Beach – With more than 30 islands, Bahrain has no shortage of scenic beaches to host a wedding. Tying the knot on a white sandy beach with sea on one side and palm trees on the other, is the ultimate dream of many, which can turn into a reality in Bahrain. With clear blue water and urban cityscape in the background, you can enjoy your big day in an intimate setting with your family and friends present. Bahrain has several public and private beaches – Bahrain Al Beach, Arad Fort Beach, Karbabad Beach and Jazair Beach to name a few. You can choose one of these beaches for your big day depending on your needs and budget. Desert – If you are one to mix romance with adventure, then an Arabian desert wedding is the way to go. Imagine the never-ending desert as a witness of your declaration of love. Desert has become a popular wedding venue with the unique setting and the stunning backdrop of sand dunes, setting sun and even camels. If you imagine your big day to be as perfect, then desert wedding in Bahrain should be your choice. Resorts and hotels – Bahrain has many luxury hotels and resorts that offer all the amenities you can imagine with private settings (beaches and even islands) to host your dream wedding in the way you always wanted. 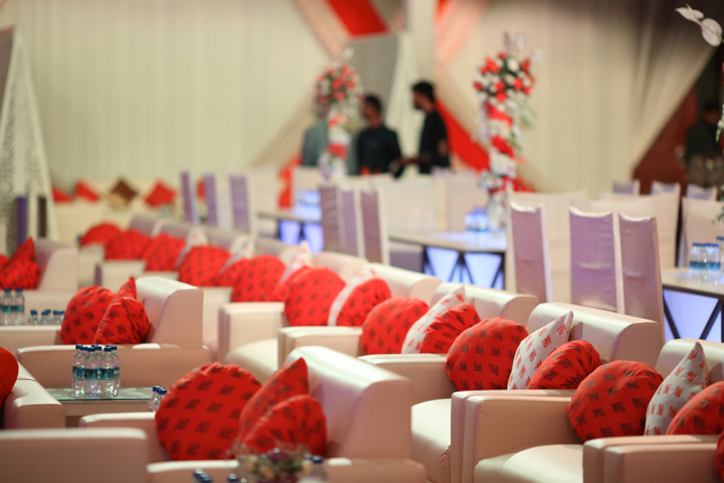 Bahrain recently hosted a grand Indian wedding, which garnered the attention of many, and proved that Bahrain is a great option for lavish destination weddings. Whether you are looking for a romantic setting for your wedding, a beach wedding, or a grand lavish event, Bahrain has everything and more. And, it doesn’t end at just wedding venues. Undoubtedly, Indian weddings are not a ‘one-day’ event. They are usually huge with events like Mehandi and Sangeet included with many guests and arrangements involved. Entertaining these many guests can be a hassle. However, destination wedding in Bahrain has it all resolved with many activities and stunning landscapes that your guests can enjoy. Beaches, historical buildings, auto race tracks, museums, ancient ruins, parks and wildlife areas – the list of ‘places to visit in Bahrain’ is long. With all this available on your fingertips, hosting your wedding in Bahrain will turn out to be one of the best decisions of your life. And, if you need help with the planning, then contact Rachnoutsav Weddings to plan your nuptials in Bahrain. Professionals at Rachnoutsav Weddings will have all your wishes and needs considered when planning your dream wedding for you.